Police in Indiana have arrested an Evansville woman on child molestation charges. 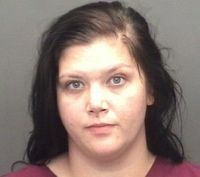 Heather Joann Devault, 27, was taken into custody after allegedly telling detectives that she twice molested the unidentified victim while high on meth. The mother of two also blamed the drug for the molestation's, according to a report. Devault, who writes on her current Facebook as being employed at the Deaconnes Hospital, is now held on a silly $15,000 bond. A then much skinner Devault also had two other accounts on the social networking giant found here and here. An older profile on MySpace still remains as well.